Motorbiking at sunrise between red Rock cliffs watching the mist roll of the ocean. 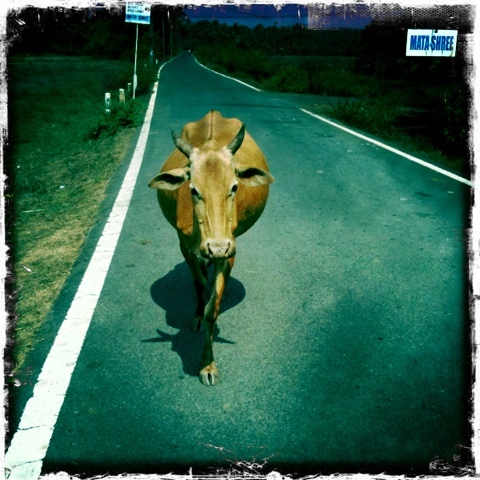 Lazily swerving around cows and dogs napping in the road. Enjoying the last of the cool breezy shadows before the sun makes his presence known. Once I hit the town it’s two fingers on the break and a thumb on the horn. They actually use the horn to communicate logisitics, like I’m passing you, or blind curve, rather than the typical NYC “get the f*** outta of my way” charm. The morning is sweep. Before breakfast, before anything, you are to sweep your home and start anew each day. It’s a nice practice. Ive been sweeping my room each morning and would like to continue this ritual upon my home coming. Time will tell. The next thing they do is throw water onto the road. The Indian people have an impressive technique for throwing water. It’s much more beautiful then you or I have ever spread it upon the earth. If water throwing were an Olympic sport the Indians would take the gold. I believe they do it to keep the dust down, sometimes they do it to disperse the cow dung – as cows are holy and roam wherever they please. Sometimes they are giving an offering or cleaning a pan- it does not matter the reason why they are throwing the water. It is always done with style and gusto. Today I go to Arambol! I have not yet been but look forward to the adventure of three bus rides and another town as I make my way to the northern part of Goa. I have been told it’s full of freaks, gypsies, and circus folk- and upon hearing this I can’t imagine why I have been visiting anywhere else. Lolololol. Oh right – discipline, focus, and all that jazz 😉 it’s been good for me to study in a quiet far-flung seaside as we all know I would not be studiously practicing in my room for hours on end in the art hub if India. Looking forward to the adventure and must get a move on before the sun gets too hot. Good morning world! Thank you for letting me travel upon you. Gravity and flight. Namaste.